I love to read because I love to meet new characters. Today we're going back in time to meet a special person presented by author Dee Dee Lane. She writes romances set in the West. DeeDee, tell us about your newest book. Thanks for hosting me on your blog, Rebecca. You said this year you were focusing on "characters," so I decided to ask - Who is the traveling man in MY TRAVELING MAN? About a year ago I was doing research for the last novella in my SLIP IN TIME series. 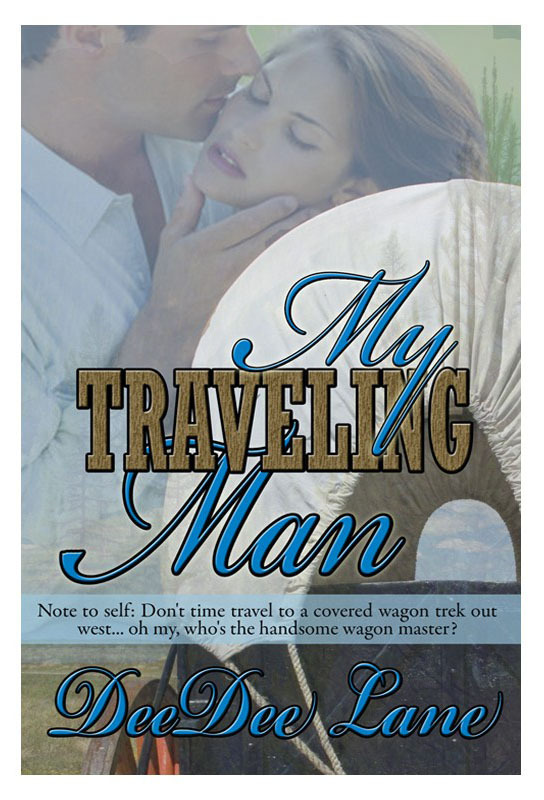 At the time I thought the last title would be about a stage coach driver who travelled back and forth across the West to deliver people and packages to wherever they needed to go. Then...one day...I came upon a short poem about a wagon master leading a wagon train traveling to Oregon Territory in the 1840's. The poem's imagery made me see the swiftly moving rivers, hear swarms of mosquitoes, listen to the voices of disgruntled, weary travelers. The poem gave me insights into the every day tragedies and joys occurring on a wagon train. Suddenly my story changed shape and I realized I had to explore this person and figure out how, what, when, why, all of those questions that motivate an author to write and re-write. Many months later and I had carved out a story with Thomas Bristol, wagon master as the hero. I hope your readers will enjoy the story, Rebecca. And may I say Happy Travels to all! Alice Hanstrom prefers books to people, facts over feelings, and in her world, "adventure" is just a word in the dictionary. That is until the night she braves shadowed hallways of the Cowboy and Western Museum in pursuit of a long-lost diary. Her search of an antique covered wagon halts abruptly when the museum slips Alice back in time. Thomas Bristol is an experienced wagon master. On a daily basis he deals with cholera, exhausted oxen, and river rapids on the treacherous journey to Oregon Territory. But he's completely flummoxed when a mysterious woman appears in Big Blue River. On the trail, Alice and Thomas strive to balance is love of roaming adventure and her desire for predictable orderliness. As the wagon train reaches Independence Rock, the sparks between them catch fire. But can such different people become equal partners in love... and can their love survive the slip in time? Thanks, DeeDee, for being my guest. Any questions or comments for DeeDee? Great interview, DeeDee. I love reading about how authors come up with the ideas for their books. I know! Me too. It's like getting a little bit of insight into their world. Thanks K.K.! I'm always fascinated on how other authors get their source of inspiration. Thanks for sharing, DeeDee! All the best! Thanks Mary - it was fun to go back and try and remember how it all started...Best of luck to you in all your writing. Interesting inspiration for your story. Enjoyed Reading about about Thomas and Alice Alice. I have to go check out The Traveling Man. Wishing you the best of luck DeeDee. Thanks Tena, It's been fun to talk to people about how they keep diaries or note down memories. Good luck with all!